Vincent Price takes his revenge a la William Shakespeare in this enjoyable comedy horror. MGM USA R1 DVD. Theatre of Blood is an independent British production, very much in the style of the AIP films of the time and it obviously owes a great debt to their earlier film Abominable Dr. Phibes (1971), reworking the idea of a serial killer, played by Vincent Price, taking revenge on those he feel has wronged him with a running theme for all the killings. Fortunately the film is different enough that it remains enjoyably original: The killings themselves are elevated the main role here, permitting much more from Price (who as Dr Phibes was saddled with horrible injuries, and usually had to simply watch as the killings occured) while the police proceedurals are almost completely absent. The tone is generally darker than that of Dr. Phibes, and certainly lacks that film's strand of straight-forward comedy, although there is plenty of dark comedy, and a very heavy layer of irony throughout. Fortunately despite the focus almost entirely on the killings, the film flows quite effectively and is pretty well paced, although some might find it rather repetitive towards the end when it does begin to drag a little. The ideas behind the murders are very well thought out and varied, taking inspiriation from well known titles such as Richard III to the far more obscure Troilus and Cressida, fortunately the script is well balanced - explaining what is going on to those not fluent in the Bard while not patronising those who do know his works. The film builds up to a rather disappointingly cliché and predictable climax. Director Douglas Hickox does a generally good job, particularly in giving atmosphere to the scenes with Vincent Price. The production is strong, evident in the extensive mix of costumes and good looking locations that the film uses while the gory effects look surprisingly effective. Composer Michael J. Lewis provides an oddly minimal score but it fits the film quite well. Top billing of course goes to Vincent Price who gets to give an entire repertory of Shakespearian characters in a performance that he correctly described as one of his very best. He seems to relish every single one, suitably hamming them up as per his character. His daughter is played by the beautiful Avengers star Dianna Rigg, who gets to wear almost as many costumes as he does and their scenes together are particularly well played. The attractive Madeline Smith (Vampire Lovers (1970)) gets a brief role, in a sadly not so brief outfit. The rest of the cast comprises a very fine selection of British character actors with good performances all round, with such names as Jack Hawkins, Authur Lowe and Robert Morley - the tragic Dennis Price appears here in one of his very last roles. 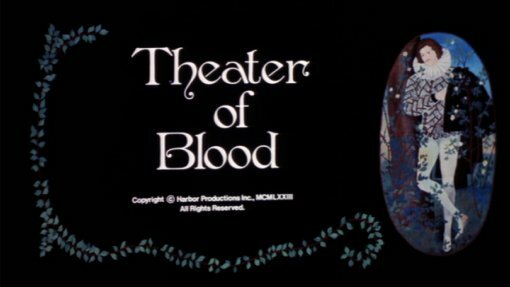 Although certainly more horror than comedy, Theatre of Blood is a treat for fans of classic horror cinema with the unimitable Vincent Price turning in one of his best performances and a nice selection of character actors on the receiving end. Shakespeare fans should find plenty to enjoy here with the clever send-ups. Generally recommended. Dennis Price - once a respected British actor who later starred in a variety of low budget horror films in the 1970s. Directed by anyone interesting? Douglas Hickox - a lesser known British director who helmed a number of interesting films, including Zulu Dawn (1979) and the classic B-movie Behemoth the Sea Monster (1959). Any gore or violence ? Some rather bloody and gory death scenes. Who is it for? Fans of Vincent Price and the AIP horror era should find plenty to enjoy here. Tower of London (1962) Vincent Price gets to play Richard III seriously in this horror tinged adaptation of the Shakespeare play by Roger Corman. Visuals Original Aspect Ratio - 1.66:1 non-anamorphic widescreen. Colour. The print quality is strong, with minimal print damage and grain. Audio English original mono. Sounds good. French and Spanish dub tracks. Availability Only available on a double-disc with Madhouse, or on an identical disc as part of the 7 film Vincent Price Scream Legends collection. Other regions? Also available in the UK and Europe on an identical disc (although with additional audio and subtitle tracks). Cuts? Believed to be fully uncut - cuts were made to the UK theatrical print but these are restored here. The print is English language. An enjoyable dark-comedy horror with a superb leading performance for Vincent Price. Recommended. Although not anamorphic this is a good looking print and solid DVD release. Find more films starring Vincent Price. All text in this review written by Timothy Young - 22nd September 2007.